Today's window treatments represent a smart new simplicity. Simple doesn't mean plain, but does suggest a crisper, cleaner approach for your manufactured home windows. Giving your windows a fresh look is easier than ever thanks to an astonishing array of high-tech shutters, shades, blinds, fabrics and decorative hardware in all sorts of colors, styles and finishes. 1. Use Bold Prints in the Kitchen - Forget outdated checks and dowdy florals. 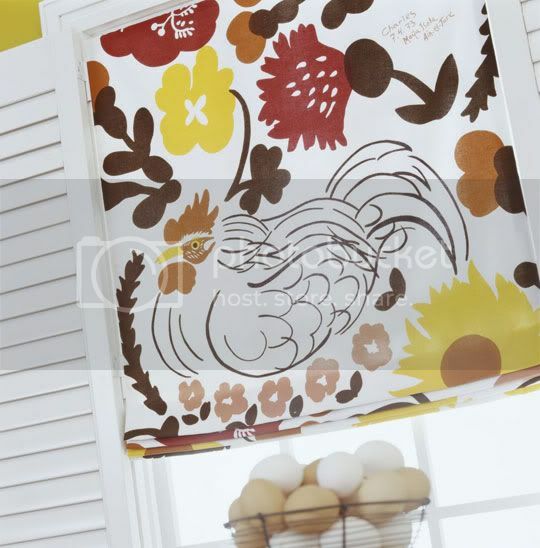 Dress the windows in your country-style kitchen with shades in a whimsical rooster print. Crisp white shutters frame the graphic print and further the country feel. Click "Read More" to view the 9 remaining window treatments to see which fits you. 2. 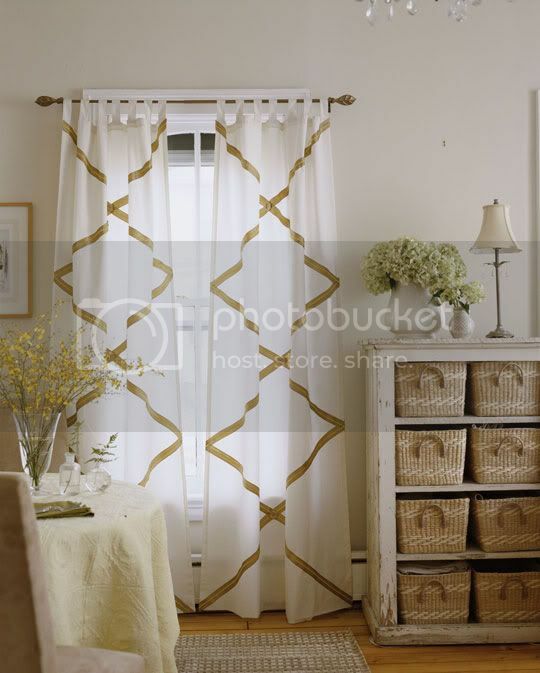 Think about Overall Style - White floor-length panels are a standard window treatment for a cottage-style space, but dressing up panels with ribbon provides an unexpected detail. The vertical diagonal design makes the treatments appear longer, and the leaf-shape finials complement the other natural elements in the room. 3. 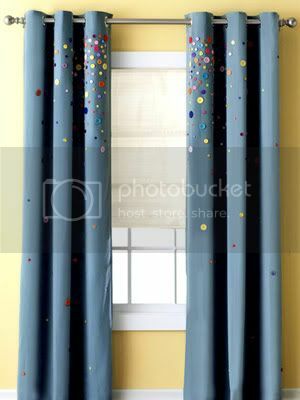 Mix Materials for Fun - Kids' rooms offer a great place in which to show off innovative window treatments. 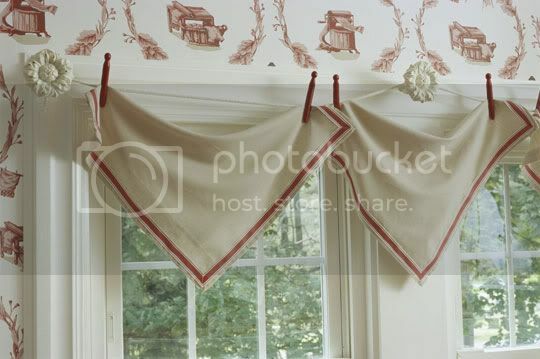 The long red valances are hung with grommets and simple hooks, making them easy to remove and clean-or swap out when your child tires of the color. The cool shutters, which feature bold blue frames and metal inserts, provide some privacy but also allow plenty of sunlight. 4. Layer Treatments for Function - Combining window treatments-in this case roll-up bamboo shades and floor-length panels-provides optimal versatility. Open the shades and panels for maximum sunlight or close them for complete light blockage and privacy. Mounting the rod high on the wall makes this room appear taller and grander. 5. 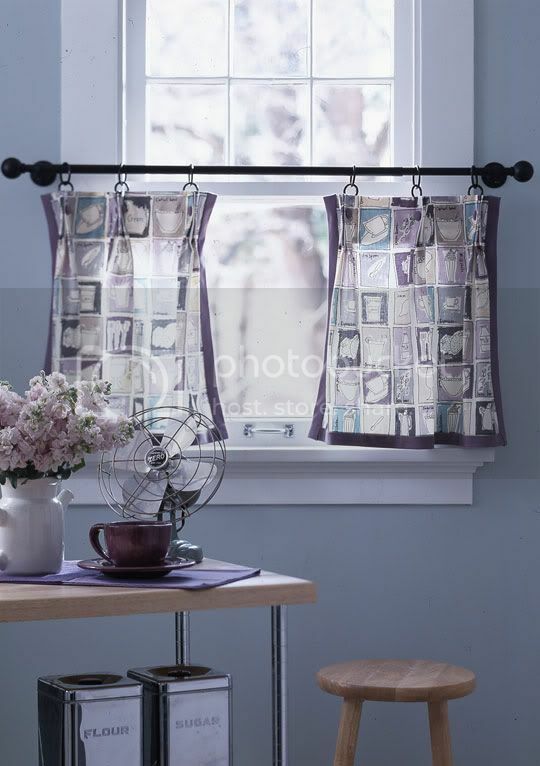 Bring Attention to Windows - Beautiful window treatments can be the star of a room. These pretty panels feature delicate embroidery, layered grosgrain-ribbon ties, and bold yellow buttons for a sweet look that isn't too granny. To let treatments like these act as a focal point, paint the walls a solid color and keep the rod and finials simple. 6. 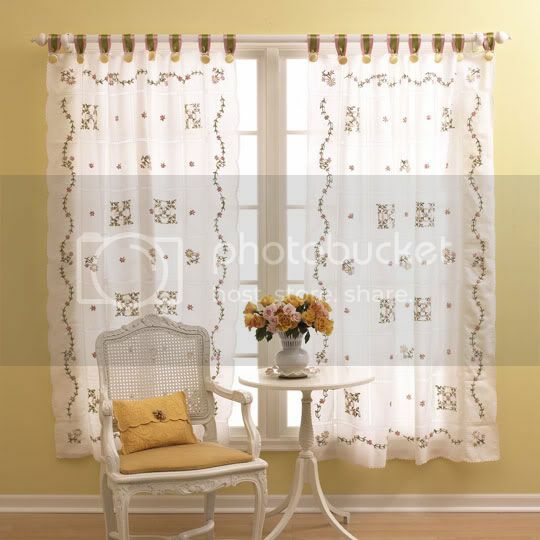 Use Large Patterns in Small Doses - Café curtains-two panels hung halfway up the window with a valance capping the top-can make a big statement. A coffee-theme print and flirty details, including ribbon trim and fabric-covered buttons at the pleats, are perfect for a kitchen. 7. 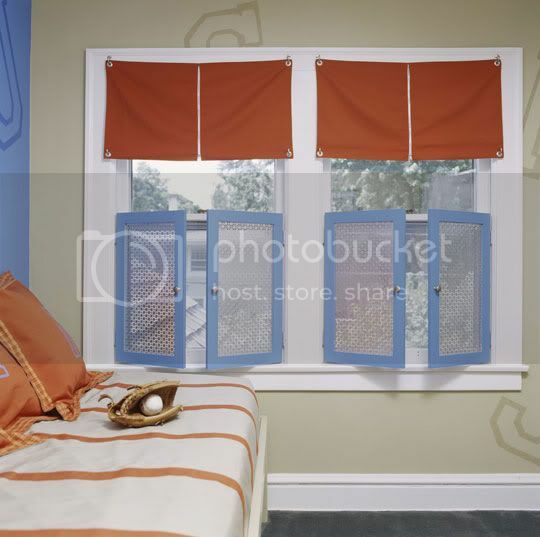 Select Versatile Shades - Window shades are all about function. Tie them up to let in sunlight or let them down for privacy. But just because shades are practical doesn't mean they shouldn't be lovely to look at. 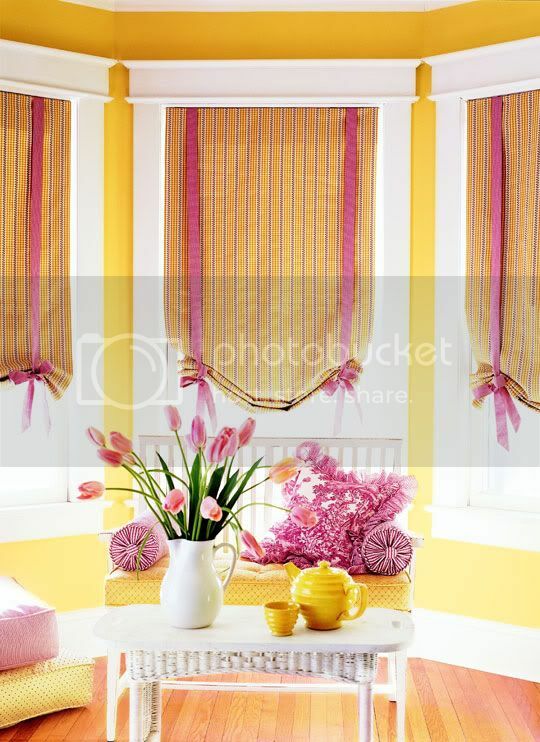 These pretty pink-and-yellow tie-up shades perfectly complement the other fabrics and weathered furnishings in the space. Mounting the shades inside the window frame shows off the wide crisp white moldings. 8. Use Everyday Materials for Treatments - Looking for an innovative valance for your dining room or kitchen? Try this! 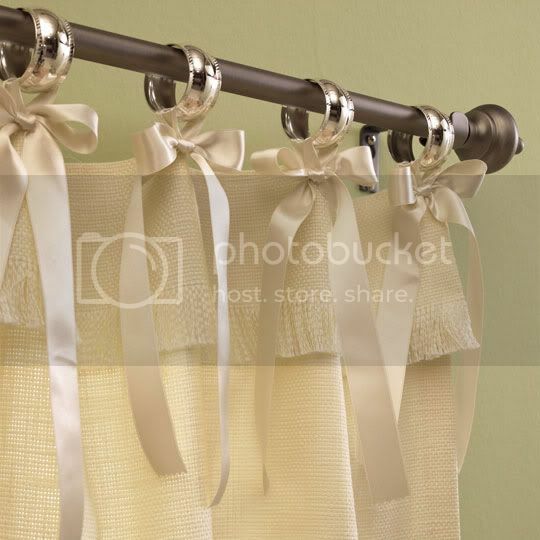 Attach decorative tiebacks to the window frame and hang a clothesline from the tiebacks. Clip napkins that complement your decor to the clothesline with clothespins for a charming one-of-a-kind treatment. 9. Use Simple Embellishments - Dress up plain panels with decorator details. Folding over the top of open-weave treatments, fringing the edge, and attaching champagne-color ribbon can look lavish, but the real sparkle comes from wide silver-plate napkin rings. The dark rod and finials provide an interesting color contrast. 10. Combine Colors and Patterns - Floor-length panels typically grace windows in traditional settings, but these fun panels are anything but staid. The trick Trimming the bottom with a bold blue band and a wide black-and-white houndstooth check adds some kick without overpowering the space. I love the double layered concept for better functioning.really helps at times.When a part is partially covered and the other free to be adjusted. Colorful designs for your window treatment add positive energy but we should always keep in mind that contracting good window installation (Toronto) is also important. This is so we can have fresh air ventilation and natural brightness in our house.